The Portuguese tax system is composed of several state and municipal taxes that may have a significant impact on investment decisions and the way in which businesses should be structured in an efficient manner. State taxes include taxes on companies' and individuals' income (corporate income tax (CIT), personal income tax and social contributions), taxes on expenditure (VAT and excise duties) and others (including stamp tax). Municipal taxes are mainly levied on the ownership and sale of immovable property (municipal property tax and property transfer tax). Several important reforms carried out over recent years have successfully put Portugal on the map for tax competitiveness regarding inward investment. Besides a very attractive corporate tax regime, Portugal offers a wide range of tax incentives and planning opportunities for foreign companies and individuals who wish to settle or to invest in and through the country. Furthermore, Portugal also offers a whole tranche of other compelling factors for consideration by potential investors, such as, to mention just a few, an appealing visa regime, workforce education and skills, qualified labour availability, a modern labour law, infrastructure, cost of real estate, R&D capability and access to Portuguese-speaking countries. Under Portuguese law, there is a choice of different legal forms for establishing a business, from sole trader to various types of companies, as defined in the Companies Code. limited partnerships (simple or limited by shares). Of the various entities on offer under Portuguese law, the two most commonly used are the private limited company and the public limited liability company. The choice of business entity is dependent on several factors: the desired degree of simplicity, both in terms of structure and operation; the minimum amount of paid-in capital required; and confidentiality issues relating to the ownership of capital. In a public limited liability company, the liability of each shareholder is limited to the value of his or her shareholding. The minimum number of shareholders for the incorporation of this type of company is five, and the capital is divided into shares. Bearer shares have not been allowed since May 2017. Private limited companies are the most common type of company in Portugal. This is the preferred model for small and medium-sized companies, given its great flexibility. For CIT purposes, partnerships are subject to the same treatment as companies, although a fiscal transparency regime applies to certain resident entities: civil law companies not incorporated in commercial form; incorporated firms of professionals; and holding companies the equity of which is controlled, directly or indirectly, for more than 183 days, by a family group or a limited number of members. A fiscal transparency regime also applies to complementary business groupings (ACEs) and European economic interest groupings treated as resident in Portugal. Taxable profit is calculated on the basis of accounting income adjusted according to specific rules contained in Portuguese tax legislation. interest and other forms of remuneration from shareholder loans exceeding certain limits. Intangible assets without a fixed life cycle acquired on or after 1 January 2014 may be depreciated over a 20-year period (5 per cent per year) counted from the initial recording of the asset in the company's books. This regime applies to the following intangible assets: industrial property such as trademarks, licences, production processes, models and other similar rights acquired for consideration and without a fixed life cycle; and goodwill arising from business restructuring transactions (but excluding goodwill arising from share transactions). The CIT Code adopts a wide definition of taxable income, and capital gains are treated as ordinary business profits and taxed accordingly. Capital gains and capital losses on the sale of a company's assets, other than those exempt under the participation exemption regime (see below), are computed as the difference between the proceeds of disposal, net of related expenditure, and the acquisition cost, reduced by any depreciation claimed. Only 50 per cent of the difference between capital gains and losses is taken into account where, in the year prior to the disposal or before the end of the second following year, the disposal proceeds are reinvested in the acquisition, manufacture or construction of tangible fixed assets, non-consumable biological assets or investment properties, but with the exception of second-hand assets acquired from related parties. Tax losses may be carried forward for five years, although any deduction is limited to 70 per cent of the taxable profit assessed in the relevant fiscal year. Losses carried forward may be lost if, between the tax year in which the losses were suffered and the year in which they are used, there is a change in the object or the activity effectively performed by the company, or 50 per cent (or more) of its share capital is transferred to different shareholders. The regular CIT rate in Portugal is 21 per cent. The tax rate applicable to the first €15,000 of the taxable income of taxpayers qualifying as small and medium-sized enterprises, as provided by EU Commission Recommendation 2003/361/EC, is 17 per cent. Companies located in the interior regions of Portugal, with economic, agricultural, commercial, industrial or service-providing activities, benefit from a rate of 12.5 per cent for the first €15,000 of the taxable amount, reducing the tax rate from 17 per cent to 12.5 per cent. A municipal surcharge is levied in addition to CIT in most municipalities at a rate of up to 1.5 per cent of taxable income. Corporate taxpayers with taxable income of more than €1.5 million are also subject to a state surcharge of 3 per cent. The surcharge increases to 5 per cent for taxable income exceeding €7.5 million, and to 9 per cent for taxable profits in excess of €35 million. CIT assessment returns must be filed by Portuguese-resident entities and permanent establishments of non-resident companies and submitted by 31 May following the end of the calendar year, or five months after the authorised year-end if the company's tax year does not follow the calendar year. An annual return containing simplified corporate information must also be filed by 15 July or by the 15th day of the seventh month following the end of the tax year. Following OECD recommendations under the BEPS Action Plan, ultimate parent entities or other reporting entities of multinational groups of companies that register turnover higher than €750 million are required to complete and file a country-by-country report. Entities with tax residency in Portugal integrating a multinational group of companies, subject to the country-by-country report obligation must also communicate to the Portuguese tax authorities by electronic means which entity constitutes the reporting entity of the group, the respective tax jurisdiction, its tax identification number and address. Taxable persons liable to CIT and their representatives must also file statements in respect of registrations, changes or cancellations on the register of taxable persons, and are required to keep a tax documentation file in respect of each accounting period for a 10-year period containing all accounting and tax information. Taxes in Portugal are administered by the Portuguese Tax and Customs Authority, which is organised as a vertical structure integrated into the Ministry of Finance and divided into two main services: the Directorate General for Taxation and the Directorate General for Customs and Excise Taxes. The Tax Authority has competence to carry out tax audit procedures, make additional and late interest tax assessments, and impose penalties and fines on non-compliant taxpayers. To reduce ambiguities, taxpayers may request advance rulings regarding their tax affairs, including their eligibility for tax benefits. When advance rulings are issued, the tax authorities may not derogate from such rulings in relation to the taxpayers that requested it, except pursuant to court decisions. By request of the applicant, and subject to the payment of a fee, an advance ruling may be provided urgently (within 75 days), provided that such request is accompanied by a tax framework proposal. The proposed tax framework and the facts to which the urgent request for an advance ruling relate are considered tacitly sanctioned by the tax authorities if the request is not answered within 75 days. Non-urgent rulings are delivered within 150 days. Apart from the advance ruling regime, a taxpayer and the Portuguese Tax Authority may negotiate advance pricing agreements on transfer pricing issues. Following a tax audit, the taxpayer is allowed to challenge an additional tax assessment made by the tax authorities, either by means of an administrative claim submitted to the tax authorities, or through a judicial or arbitration appeal to the tax courts or to the tax arbitration court. Decisions of the tax courts may be appealed to the Central Administrative Court of Appeal or to the Administrative Supreme Court. Portuguese-resident companies that are members of an economic group may opt to be taxed under the special group taxation regime. The parent must hold, directly or indirectly, for a minimum one-year period, at least 75 per cent of the subsidiaries' share capital and 50 per cent of their voting rights. All companies in the group must be tax-resident in Portugal (albeit indirectly held, through an EU or EEA resident company), and must be subject to Portuguese CIT on their worldwide income at the standard CIT rate to benefit from this regime. This regime is also applicable if the parent company has a permanent establishment in Portugal that holds the capital of the subsidiaries, and some other cumulative conditions are met. Entities with tax losses in the preceding three years are not eligible for this regime, except where their share capital has been held by the parent for more than two years. Portuguese VAT legislation basically follows the EU common system of VAT. It applies to the supply of goods, services, and intra-Community acquisitions and imports into the Portuguese territory. Any person or corporate entity that independently carries out an economic activity, or that carries out a single taxable transaction either in connection with the performance of the above-mentioned activities or that is subject to personal tax or CIT, is liable to charge VAT on every supply it makes in the scope of its activities, and afterwards to deliver the due amount to the tax authorities. There are three VAT rates: 23 per cent (standard), 13 per cent (intermediate) and 6 per cent (reduced). In the autonomous regions of Azores and Madeira, the VAT rates are currently reduced to 18 and 22 per cent (standard), 9 and 12 per cent (intermediate), and 4 and 5 per cent (reduced), respectively. IMT is levied on the onerous transfer of immovable property. The tax is payable by the purchaser, whether an individual or a company, resident or non-resident. The taxable amount corresponds to the higher of the contractual price or the patrimonial tax value. rural or urban property where the purchaser is domiciled in a blacklisted jurisdiction: 10 per cent. IMI is levied annually on immovable property located within each municipality. The tax is payable on the taxable value by the owner of the property as of 31 December of each year, to be paid in up to three instalments in the following year. The taxable value of urban property corresponds to the patrimonial tax value recorded on the tax registry. rural or urban property where the owner is domiciled in a blacklisted jurisdiction: up to 7.5 per cent. AIMI is annually due by individuals, companies and undivided inheritances that own residential real estate located in Portugal and the taxable basis corresponds to the summation of the tax registration value (TRV) of all the urban properties owed or held by each taxpayer (reported as at 1 January of each year). From the sum of the TRV of all the urban properties and applicable taxable basis is deducted the amount of €600,000 for individuals and undivided inheritances and, €1.2 million for married or living in non-marital partnership taxpayers, who opt to submit a joint tax return. urban properties owned by entities in blacklisted countries: 7.5 per cent. Stamp tax is generally charged on certain formal acts and documents, such as transfers of title and contracts, which are signed or take place on Portuguese territory and which are not subject to VAT, as outlined in the General Table of Stamp Tax. Loans granted to resident entities, regardless of the nature or place of domicile of the lender, are generally subject to stamp duty ranging from 0.04 to 0.6 per cent, depending on the term of the credit or loan given. A tax exemption may be granted to the following operations provided certain requirements are met: long-term loans qualifying as suprimentos2 for Portuguese commercial law purposes, made by a shareholder to a company, provided that the participation exemption requirements are met concerning the level of participation and detention period; and short-term (less than one year) cash management loans made by parent companies to their subsidiaries. Companies are deemed to be resident in Portugal for tax purposes if their head office or place of effective management (regardless of the head office's jurisdiction) is located on Portuguese territory. These two criteria are often met simultaneously, providing consistency under tax law. However, where this is not the case, the place of effective management is the decisive factor. According to Portuguese case law, the place of effective management is defined as the place where the management decision-making takes place, and where adequate substance (in the form of both people and real estate) exists. Resident companies are taxed on their worldwide income. Non-resident companies are taxed on their Portuguese-source income. In general terms, domestic branch profits are taxed on the same basis as corporate income. Nevertheless, there are some differences in tax treatment (general administrative expenses incurred by the head office may be allocated to the branch, and there may be certain restrictions concerning the deductibility of certain expenses charged by the head office to the branch). All income is included in the tax base, regardless of its geographical source, provided that such income is attributable to the permanent establishment located in the Portuguese territory. All allowable items of expenditure, deductions and credits are also taken into account, regardless of the source of the income to which such items relate, with the same requirement mentioned above. The non-habitual residents regime is available for citizens who have become Portuguese residents for tax purposes, according to the criteria defined by the PIT Code, and who have not been deemed resident in Portugal in any of the previous five years. The non-habitual residents regime is applicable for 10 consecutive years, under the condition of being considered as a resident during that period. If a taxpayer does not meet the requirements to be considered as resident in any year or years within that period (thus not using the complete period), the taxpayer may resume the use of this regime as soon as he or she meets the requirements. Portuguese income obtained from highly added value activities of a scientific, artistic or technical nature is taxed at a special rate of 20 per cent. These activities are defined in Ordinance No. 12/2010 of 7 January, and include architects, engineers and similar professionals, visual artists, actors and musicians, auditors, doctors and dentists, teachers (psychologists, liberal professionals, technicians and the like), and investors, managers and directors. The exemption method for the elimination of double taxation will be applicable on income derived from foreign sources in categories A (employment), B (self-employment), E (capital income), F (real estate income) and G (assets), provided that some requirements are met. the profits or reserves do not qualify as deductible costs in the distributing entity. Under the same universal principle of double taxation relief, companies with a registered office or effective centre of management in Portugal may exclude from their taxable base earnings and losses attributable to permanent establishments located outside Portugal, provided that the following conditions are met: the permanent establishment is subject to and not exempt from a rate of tax not less than 60 per cent of the CIT rate in the state of its location; and the permanent establishment is not located in a blacklisted jurisdiction. the accounting records of the taxpayer are organised in such a way as to allow the identification of the costs and losses directly attributable to the industrial property right subject to the assignment or temporary use. National and foreign companies that intend to invest in Portugal in certain sectors of activity may apply for financial incentives granted by EU structural funds under the National Strategic Reference Framework. Apart from such financial incentives, eligible productive investment projects set up by 31 December 2020 may also benefit from certain contractual tax incentives under the Tax Investment Code, such as CIT credits, or real estate and stamp tax reductions or exemptions. This regime complies with the EU state aid rules. Apart from the exemptions from withholding tax on outbound payments granted under the CIT Code (see below), there are some other notable tax incentives provided in the Portuguese Tax Benefits Statute and ancillary legislation. The following are an example of such incentives. Companies licensed to operate under the scope of the Madeira International Business Centre benefit from extremely attractive tax benefits, such as a reduced CIT rate of 5 per cent until 2027 (except for intra-group services, financial intermediation and insurance), and exemptions from stamp duty and from property transfer tax and municipal property tax in relation to real estate located in Madeira and registered for company business use, depending on the date of the licence. Shareholders of the companies covered by the scheme, both individuals and companies, may benefit from income tax exemption on dividends and interests paid out. Under this regime, Portuguese UCIs only, including securities investment funds (SIFs), real estate investment funds (REIFs), securities investment companies (SICs) and real estate investment companies (REICs), are tax-exempt regarding dividends, interest, rental income and capital gains included in their taxable profits. The taxation of non-resident investors will depend on the type of UCI to which the income relates. Income arising from SIFs and SICs, including income distributed by these entities, capital gains from the disposal of units or shares, or income arising from the redemption of units, is fully exempt from tax in Portugal. Income arising from REIFs and REICs, including income distributed by these entities, capital gains from the disposal of units or shares, or income arising from the redemption of units, is subject to a 10 per cent flat rate tax in Portugal. Furthermore, income arising from REIFs and REICs, including capital gains from the disposal of units or shares and income arising from their redemption, shall be considered as income from immovable property (i.e., shall qualify under Article 6 of the OECD Model Tax Convention). When more than 25 per cent of non-resident entities are directly or indirectly held by Portuguese residents, or are located in blacklisted jurisdictions, they are subject to tax on all income arising from UCIs at a rate of 25 or 35 per cent, respectively. capital gains realised by non-resident entities on the sale of shares in the capital of a company resident in Portugal, at least 50 per cent of whose assets are made up of real estate situated on Portuguese territory. Under this regime, 7 per cent of cash contributions made by the shareholders, as well as of conversions of shareholder loans made upon the incorporation or at the time of a capital increase, up to a €2 million threshold, may be deductible from the company taxable income. Targeted to attract individuals' investment in start-ups, the programme allows for a deduction to the investor payable income tax (up to a limit of 40 per cent) of 25 per cent of the cash contributions. Capital gains from the sale of the start-up company shares may be excluded from taxation if the sale price is reinvested in new eligible investments. Except in certain circumstances, most income obtained by non-resident entities in the Portuguese territory is subject to withholding tax. Income is deemed to be obtained in Portugal if the debtor is a resident, or has its head office or place of effective management, in Portugal, or if its payment is attributable to a permanent establishment in Portugal. The CIT withholding tax rate is generally 25 per cent. has held, directly or indirectly, for a 12-month period prior to the distribution a participation of at least 10 per cent of the share capital or voting rights of the company. If the 12-month period is not completed, dividends paid will be subject to a 25 per cent withholding tax (which can be recovered after the completion of such period) eventually reduced under an applicable tax treaty. Under a specific domestic anti-abuse provision (resulting from the transposition of Council Directive 2015/121/EU, of 27 January, which amended the Parent–Subsidiary Directive), withholding tax exemption on dividends is denied in case of an arrangement or series of arrangements the main purpose of which is to obtain a tax advantage that defeats the object and purpose of eliminating double taxation on profits, in case such arrangement or series of arrangements is not regarded as genuine, all facts and circumstances considered. For completeness, an arrangement or series of arrangements is not regarded as genuine if it is not based on valid economic reasons and has no economic reality. Interest paid by Portuguese-domiciled subsidiaries to a parent company that is a resident in an EU Member State may benefit from a withholding tax exemption under the EU Interest and Royalties Directive. In addition to Portuguese domestic arrangements that provide relief from international double taxation, Portugal has entered into double taxation treaties with 79 countries to prevent double taxation, 77 of which are already in force. Under these treaties, withholding tax rates on outbound dividend, interest and royalty payments are reduced wherever the beneficial owner of the income derived from Portugal is a tax resident of the other contracting state. 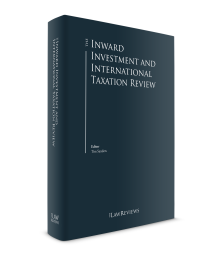 For a detailed list of the tax treaties in force and rates applicable to interest, royalties and dividends, see Appendix I at the end of the chapter. Portugal is a signatory of the Multilateral Convention to Implement Tax Treaty Related Measures to Prevent Base Erosion and Profit Shifting (MLI). Under this convention, Portugal is expected to modify its existing bilateral tax treaties in order to include specific rules preventing the granting of treaty benefits in deemed inappropriate circumstances, notably in situations of creation of opportunities for non-taxation or treaty-shopping arrangements aimed at obtaining reliefs for the indirect benefit of residents of third jurisdictions. Although the precise terms under which each treaty will be modified to include MLI provisions are not known, the amendments are expected to become effective as of beginning of 2019, once the ratification procedures are completed. Residents who receive foreign-sourced income are entitled to a tax credit equal to the lower of the foreign tax paid or the Portuguese tax payable on such income. The credit applies to income derived from treaty and non-treaty countries; however, for treaty countries, the credit is limited to the amount of tax payable in the source country under such treaty. Under the domestic participation exemption regime, dividends from qualifying holdings paid to Portuguese tax-resident parent companies may benefit from a CIT exemption (see above). The former thin capitalisation rules were abolished on 1 January 2013, and replaced by an earnings stripping rule that limits tax deductibility of interest expenses. Under this rule, net financial costs are only deductible up to the higher limits of €1 million or 30 per cent of the earnings before interest, taxes, depreciation and amortisation. The non-deductible excess may also be considered in the determining of the taxable profit for the following five years after the net financing expenses, with the consideration of the limits above. Furthermore, in respect of shareholder loans, deductible interest cannot exceed the 12-month Euribor rate in force on the day the loan was granted, plus a 2 per cent spread or 6 per cent spread for medium-sized enterprises. This limitation does not apply where transfer pricing rules are applicable. Under the Portuguese Commercial Companies Code, the payment of dividends or reserves to shareholders is disallowed in the following situations: where any profit is needed to cover accrued losses or to rebuild legal or statutory reserves; incorporation and R&D expenses are not fully depreciated, unless the amount of the free reserves and retained earnings is at least equal to non-depreciated expenses; or where the company's net equity is less than the sum of its share capital and reserves. Companies may return cash to shareholders by means of a dividend distribution, capital reduction, redemption of shares or liquidation. A payment to shareholders in connection with a reduction of capital along with redemption of shares is regarded for tax purposes as a capital gain on any value exceeding the purchase price of the shares. Liquidation proceeds are deemed to be capital gains or capital losses that are eligible for the participation exemption regime. Business acquisitions are usually structured as either asset or share deals. The main difference between asset and share deals is the type of tax treatment. There are various taxes that can be either levied on the acquisition of assets (property transfer tax, VAT or stamp tax) depending on the nature of the assets. On the other hand, the obtaining of taxable capital gains is less likely on a sale of shares. The acquisition of shares of a public limited liability company is not subject to VAT or property transfer tax. The acquisition of shares of a private limited company, of a general partnership or of a partnership association is subject to IMT where these entities hold property and where, following the share acquisition, one of the shareholders will hold at least 75 per cent of the share capital, or the number of shareholders will reduce to two, with these two individuals being spouses married under the regime for general community property. Restructuring operations such as mergers, demergers, spin-off transactions, transfers of assets and share exchanges may be performed without income tax constraints for companies and shareholders involved under the Portuguese fiscal neutrality regime. Exemptions from property transfer tax, stamp tax and notarial and registration fees may also be granted by the Ministry of Finance upon request, provided that certain conditions are met. When a company transfers its tax residence abroad, the company is deemed liquidated and is subject to CIT on the positive difference between the market value and the book value of its assets, provided that these are not allocated to a permanent establishment of the company in Portugal. The same regime applies on the cessation of activity of a permanent establishment of a non-resident entity located in Portugal and to the transfer outside Portuguese territory, by any act or legal instrument, of assets allocated to that establishment. The tax liability resulting from the transfer of residence can be deferred where the transfer is made to an EU or EEA Member State, provided that certain conditions are met. Portuguese general anti-avoidance rules provide for a general principle of substance over form under which the tax authorities may disregard the legal form agreed upon by the parties where a transaction is deemed exclusively or principally tax-driven, and they may recharacterise the facts for tax purposes in accordance with the underlying economic reality. adoption of the 2014 EU directive on automatic exchange of tax information and exchange of information procedures under the Common Reporting Standard. Under the CFC rules, profits or other income derived by non-residents in the Portuguese territory and subject to a more favourable tax regime can be attributed to Portuguese-resident shareholders who hold, directly or indirectly, at least 25 per cent of the share capital (or 10 per cent if more than 50 per cent of the share capital of the non-resident company is held, directly or indirectly, by Portuguese-resident shareholders) in proportion to their shareholding. Portugal has implemented detailed transfer pricing legislation that broadly follows the methodologies and principles in the OECD guidelines. Under Portuguese transfer pricing rules, domestic and cross-border inter-company transactions must be at arm's length, and the Portuguese tax authorities have wide-ranging powers to adjust declared income if they consider that market conditions have not been respected. Special relations are deemed to exist between two entities where one such entity has the power to exercise, directly or indirectly, a significant influence on the management decisions of the other entity. All companies undertaking transactions with related entities, even if they are not obliged to prepare a transfer pricing file, have to fill out additional declarations as part of their annual tax reporting obligations. Additionally, taxpayers with annual net sales and other income equal to or greater than €3 million in the fiscal year prior to the year under consideration are required to prepare a transfer pricing file, which should contain an analysis of all of the aspects of every transaction with related parties. Upon request, tax and social security authorities may deliver a written confirmation that a company's tax affairs are in order. These certificates are valid for three and four months. Binding advance rulings may be awarded in specific situations (see above). Upholding the stability trend seen in 2017, the year in review was not marked by any major modification in the tax framework. A negative highlight goes to the increase, from 7 per cent to 9 per cent, of the tax rate applicable to highest bracket of the corporate income tax state surcharge (income in excess of €35 million). Positive news came, in contrast, from the definitive elimination of the surcharge to personal income tax, a remainder of the austerity measures introduced during the financial crisis, and from the refit of the tax incentives regime for urban rehabilitation. In general, 2018 maintained the growing trend of foreign investment from recent years, although still heavily tourism and real estate-driven. The year was also marked by the increase in the number of foreign citizens seeking to reside in Portugal, putting additional pressure on the real estate residential market. The commercial real estate investment market is also expected to achieve a new record, with an increase in the number of new players and the diversification of alternative products. Contrary to the most pessimistic expectations, Portugal managed to achieve a political stability that has proven key in achieving the budgetary targets and maintaining the current path of growth. For 2019 it is expected that the economy will maintain a good pace, with a GDP increase and a continued decline in the unemployment rate. The state budget will target a deficit of 0.2 per cent of GDP, which is the smallest in the country's democratic history. Private consumption and the number of tourists is expected to continue to 'heat up' the economy, although with more moderate increases than in 2018. From a tax standpoint, the state budget proposal for 2019 does not foresee significant changes to the law in force. As regards corporate income tax, the decrease of the nominal tax rate to 19 per cent foreseen in the 2014 tax reform seems to have been definitely discarded. A new corporate income tax benefit was announced for companies established in Portugal, in respect of expenses resulting from the creation of jobs. In contrast, however, taxation over deductible expenses related to company cars will see a significant increase. Regarding personal income tax, 2019 is not likely to bring any relief. The only significant measure expected to occur in this regard consists of a new tax incentive aiming to attract Portuguese citizens living overseas who left the country during the economic crisis. Under the proposed regime, a 50 per cent exemption of personal income tax may be granted to the employment and professional income of persons who become tax residents in Portugal and were a resident in Portugal up to 2015, provided they have not resided in Portugal in any of the previous three years. 2 A legal concept for shareholder loans with a deadline for repayment of over one year.